....Along with the lovely, captivating geranium fragrance was the pervasive odor that I thought was wet onions. I found this very odd at the time because there were no onions to be found in even the emptiest of the bunkers. If I had been looking at a watch, I could have told you shortly thereafter what the time and date was when my severe, chronic cough began. Like many Gulf War veterans (and Iranian veterans of the Iran-Iraq War who preceded us), it has never subsided. For years, I believed that my black sputum that I coughed up for three months, and the never-ending cough that continued thereafter, was the result of the oil well fire smoke. Years later, I was horrified to learn that what I smelled that day were the characteristic odors of Lewisite and Mustard, a classic mixture used heavily by the Iraqis during the Iran-Iraq war. Even still, I discounted that my severe respiratory illness that began very shortly thereafter could have been because of these blister agents, not knowing until more recently that while the damage is immediate, the symptoms of mustard agent exposure don’t show for as long as even 24 to 48 hours after exposure, and that the vapors I inhaled that day—by the fact that they were strong enough to be smelled—were also strong enough to do immediate and lasting damage to my entire respiratory tract that corresponds with my symptoms at the time and since. 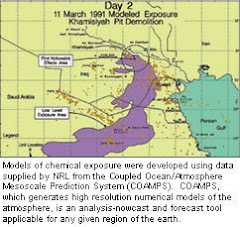 After talking with my doctors, the soft, blackish chunks I coughed up at the end of the Gulf War, some as wide across as a dime or larger, were almost certainly not oil well fire residue, but instead soot-tinged lung tissue being sloughed off after being blistered by these Iraqi chemical warfare agents. And notably, because there were only two or three of us in those bunkers, with me in them the longest, and because none of us were well trained enough to ever recognize these characteristic odors, they were never reported—except to my family, as ironically I searched after the war in Arab shops for the uniquely fragrant, geranium-scented perfume to buy for my mother that I was certain the retreating Iraqi troops had been using so heavily that it had left its scent behind in those bunkers. 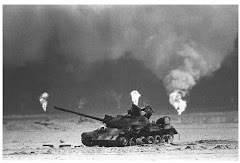 I have heard enough first-hand accounts from other Gulf War ground troops about coming across chemical mines, being hit with isolated chemical attacks, and more that I now firmly believe that the CIA and DOD has no basis for their long-held statements that Iraqi ground commanders never possessed or used chemical weapons during the war. The extent and impact of intelligence failures were widely discussed on and off the battlefield, and if there is further interest and a proper request to do so, I would be happy to provide more information in a closed setting on this issue. Lewisite: Lewisite is a type of chemical warfare agent. This kind of agent is called a vesicant or blistering agent, because it causes blistering of the skin and mucous membranes on contact. Adverse health effects caused by sulfur mustard depend on the amount people are exposed to, the route of exposure, and the length of time that people are exposed. It damages DNA, a vital component of cells in the body. Exposure to sulfur mustard is usually not fatal. When sulfur mustard was used during World War I, it killed fewer than 5% of the people who were exposed and got medical care. People may not know right away that they have been exposed, because sulfur mustard often has no smell or has a smell that might not cause alarm. Typically, signs and symptoms do not occur immediately. Depending on the severity of the exposure, symptoms may not occur for 2 to 24 hours. Some people are more sensitive to sulfur mustard than are other people, and may have symptoms sooner.